It’s taken me years to get consistent and repeatable results with SEO and it's all because I’ve done a lot of experimenting to push the limits of Squarespace SEO. This article only covers on-page SEO which is one part of the overall search puzzle. If you’re looking to see significant improvements in your ranking, you’ll need to tailor content to what people are looking for, satisfy them. This is one of the easiest mistakes to make - it’s the first SEO setting in the admin panel, why wouldn’t you fill it out? It becomes the default meta description for every page on your site which Google advises against. This means you’ll end up with duplicate meta descriptions where you don’t want them. And while this wont affect rankings directly, it will affect click through rates - which has a direct impact on your traffic. Your Facebook shares will all have the same description. This means if you or anyone else ends up sharing your content on Facebook, instead of seeing relevant description, they’ll get this catchall instead. Best practice: Every page on your site should have a unique meta description. For product pages your product description works as the meta description. I see this one all the time and it’s especially relevant to local and professional service businesses. Your homepage title tag is the primary indicator of what your website / business is all about. It’s what people see when they Google your brand. Squarespace uses your SiteTitle as the default, but you should always use a descriptive and location based keyword when applicable. If you’re building a website for a client, do them a favor and check out the keywords they want to rank for. What are the search volumes? Is this keyword worth targeting? Chances are they don’t know the search volume for their chosen keywords and could possibly be choosing the wrong keywords altogether. Including keyword research into the design process early on, serves both the client and the design because you’ll have a much clearer idea of what you’re optimizing for, and how to best structure the site for optimal SEO. Here’s an example where the keyword we thought was most relevant only averages 20 searches a month, whereas a related (and more descriptive term) averages 3,600 searches a month. Pro Tip: Verify your site with Google Search Console to learn which keywords are driving the most traffic to your existing site. If you’ve tried updating your meta descriptions on the Bedford template you know what I mean. Certain templates use the meta description in the page layout, like in the header banner - which may or may not be what you want. Here’s a list of the offending templates below. If you use any of these you’ll have to use some custom CSS to hide the description from showing up on your template. Adirondack Appears below the banner image (excluding Blog, Gallery, and Album pages) when Show Page Titles & Descriptions is checked in the Style Editor. Avenue Appears on Gallery Pages when accessed via the Index Page. Overlays banner images on Regular Pages. Supports special styling options. Tip: Slideshow banners use image descriptions as the overlay text instead. Five Overlays banner when Banner Content is set to Page Title Description in the Style Editor(excluding Album pages). Flatiron Appears on Gallery Pages, and on Regular pages accessed via the Index Page. Momentum Appears at the top of Regular, Products, Blog, Events, and pages within the Index Page. Overlays banner images. On Gallery Pages, description appears on the page. Descriptions on banners don't display on smartphones. Overlays banner image for pages outside the Index Page. Appears in the page overlay on all pages. There are cases where people lose their rankings moving to Squarespace, not because it’s bad for SEO but because the URLs from the old site don’t get mapped correctly. If you’re moving from another platform like Wordpress or Shopify where your URL structure is different - this is a must. It’s also relevant whenever you update slugs. Here’s how to use it use it. It’s easy to create new or duplicate pages and forget to change the URL slugs. You can easily avoid this mistake by including a URL check in your preLaunch checklist. As far as best practices go - simple URLs help google and the user understand what the page is about. 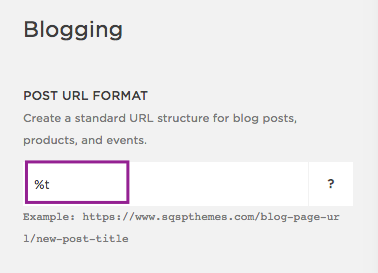 To simplify your blog post URL’s go to Settings > Blogging > Post URL format (remove %y/%m/%d/ and keep %t). If you can’t answer those questions you don’t have enough descriptive content. Pro Tip: If you’re using the Brine template, you can make use of the intro section in the page layout for your blog and product collections. 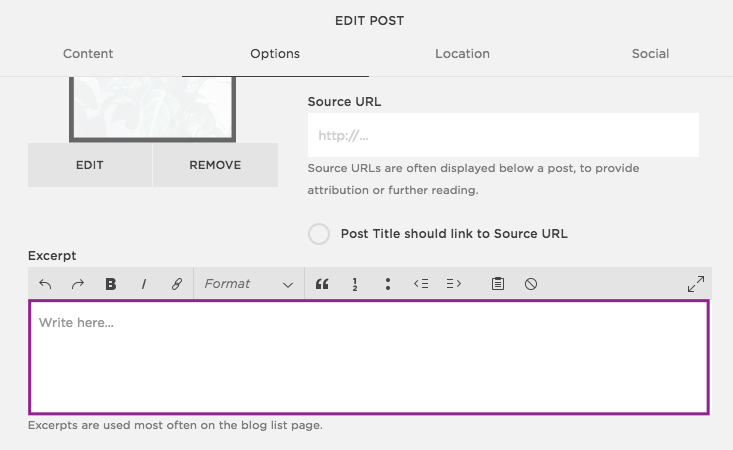 This will allow you to add a relevant H1 heading and content to the page. Designers will sometimes add text to images in layouts to avoid any complicated CSS. I’ve noticed it in certain Design Kits and it poses an SEO problem because Google can’t crawl text in images. Here’s a video case study on how this can negatively affect your SEO. There’s a saying, “what get’s measured, get’s managed” and the best way to manage an SEO campaign is to have measurable conversion goals and metrics. This is a rich snippet generated based on schema markup. This is especially useful if you have any of the following content types. To add this kind of markup there are schema generators that can generate the code for you or you can hire a developer to optimize your code with the right tags. I currently use Wiremo for product reviews and it automatically generates the review schema. It’s also another way of getting user generated content. The whole point of alt text is to help crawlers understand what your images are about. 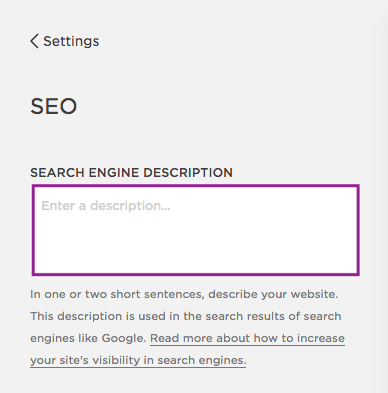 This is an easy way to tie in keyword phrases and descriptions that support your main topic. Here’s a tweet from Google’s John Muller on the topic. Tip: To get maximum benefit make your image filenames descriptive as well. Naturally there are going to be pages on you don’t want to index. Maybe they’re still in development or not intended to be found via search. In these cases you’ll want to use the meta robot tags below in your page header settings. Most SEO advice says, blog, blog, blog, with little guidance on what to create and how that content will translate traffic to sales. Here’s a video I did on few simple content strategies you can use to grow your rankings, increase your authority and earn more sales. Google has an algorithm called RankBrain that factors in the time someone spends on your site after clicking through from Google. The idea is, the longer they spend on the site, the better. Blog comments are an easy way to increase that dwell time and get people to come back and engage. I’ve been guilty of this for years. 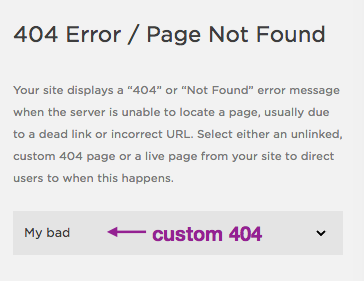 In the event a visitor stumbled on a broken page, your 404 page is an opportunity to help point them in another direction. Here’s a few good examples. I’m always stumbling on unsecured Squarespace sites. 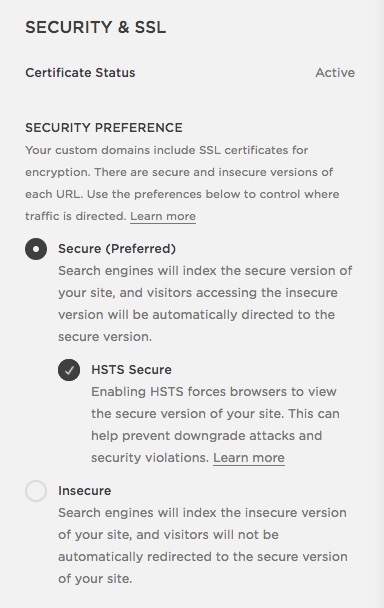 In 2014 Google made HTTPS a ranking signal, so it wise to turn it on. This is a huge opportunity if you serve local customers and clients. Set your business location and contact in the Business information panel. Get local reviews using Google, Yelp, Facebook, etc. If so, leave a comment below and share any takeaways. The biggest mistake is thinking this is where your SEO stops. To improve rankings you’ll need to promote your content and get reputable sources to link back to your site. This takes time and works best as a part of a holistic marketing strategy.